Animal use only lasers. Always consult a licensed veterinarian before buying or using any laser on your pet. One of our best sellers. 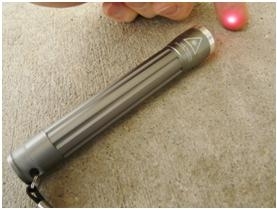 This is a high quality 650nm/5mW (Red) cold laser used to treat acupuncture points and skin. The 650nm wavelength is very useful for treating wire cuts on horses as well as reducing pain and inflammation. This laser comes with a packet of treatment formulas, charts (horse, dog, and cat), and a user manual. Runs on 2 AA Batteries. Laser comes with 2 AA batteries. The use of proper laser safety glasses is always recommended when you use any laser. Never direct any laser towards the eye. Your pet's eyes must be covered if the beam is directed near their face. Most treatments are skin-to-laser contact which helps prevent any direct eye contact with the beam. Laser safety glasses may be bought separately on this website.